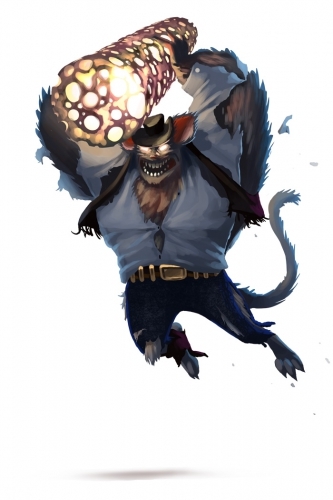 The Battering Ram is a breed of mouse found in Fort Rox. They are not known to drop any loot. Cheese: Standard Cheese Charm: ?? Well-dressed and with a wide grin, this cowboy has a gleam of meteorite shining in his eyes and he won't stop until he gets more! Wielding a solid column of meteorite rock, you better catch him before he catches your walls! When attacking your wall with his battering ram, it produces so much force that it explodes into a cloud of miniscule fragments and dust. He will cause damage to your fort wall even if caught, so avoid him at all costs! Rumor has it that this mouse was specially trained in the light of the moon, which gives him his frenzied strength. However, he ironically hates the taste and sight of Crescent and Moon Cheese, recoiling from the imitation moonlight and running off to protect his precious columns of rock! The Battering Ram mouse prefers Standard Cheeses, and will avoid traps baited with Crescent or Moon Cheese. Arcane and Shadow weapons are less effective against the Battering Ram Mouse. Other Power Types are ineffective. Battering Ram mice can only be encountered during the Twilight, Midnight, Pitch, Utter Darkness, and First Light phases at Nighttime and at Dawn while hunting with Standard Cheeses in Fort Rox. The Battering Ram is extremely difficult to catch; one strategy is to wait until the Power Enchantment upgrade has been completed, then hunt with Tower Mana activated so as to have a chance at an instant defeat. The Battering Ram Mouse drops the Dawn Egg during the annual Spring Egg Hunt. This page was last edited on 27 May 2017, at 01:48.